What is ((OTRS)) Community Edition? ((OTRS)) Community Edition is one of the leading open source service desk systems. The system includes a professional ticket system, an ITIL compatible ITSM solution, mobile solutions, and a strong community! ((OTRS)) Community Editionis a ticket system that is under dynamic development which offers powerful handling options. Various media such as web, mail, text message are supported, and open interfaces to other systems such as, e.g., your customer database are offered. ((OTRS)) Community Editioncan be used in many areas as a ticket system for internal processes, and as a full-featured help desk for companies that have many external clients. Fast detection of malfunctions and errors. Mapping of responsibilities for departments and subdivisions. Guaranteed compliance with internal processes thanks to forced control through workflows. Statistical analysis of ticket volumes. Compliance with external service commitments (Service Level Agreements). Full transparency of transaction processing. Systematic collection of questions and answers for FAQs. Incident, Problem, Change, Knowledge, Request Fulfilment, Service Asset & Configuration, Service Level Management. ((OTRS)) Community Edition is part of the ITSM suite developed by Sector Nord AG. Thanks to the interfaces to our other apps, you have always a complete overview over the customer's or ticket creator's affected devices. You automatically receive tickets if systems in your IT landscape fail. This means that you can always respond in good time to meet your SLAs and satisfy your customers. 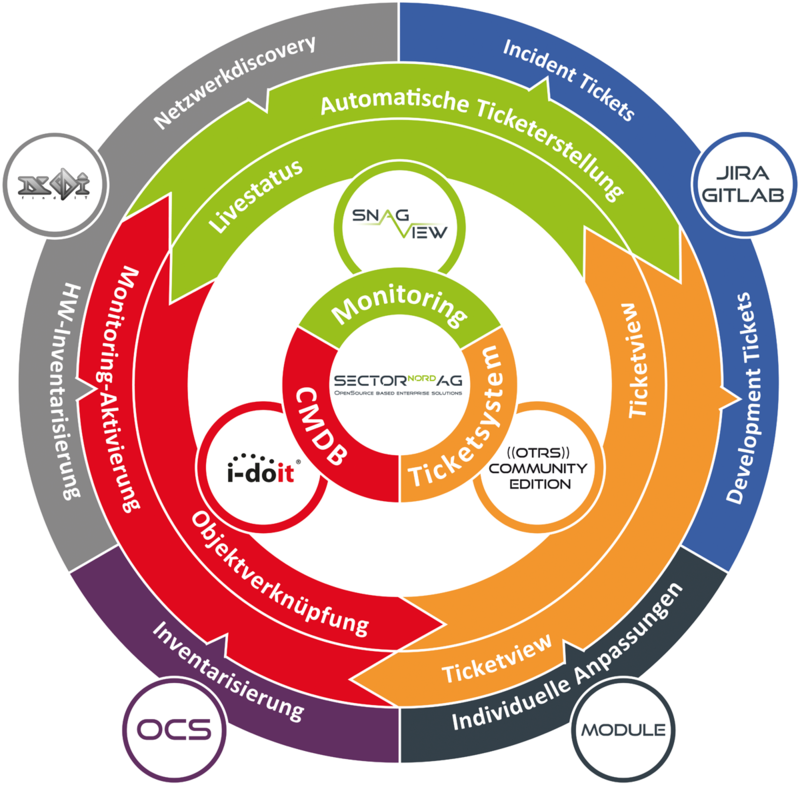 To implement the complex customer requirements for an intuitive and dynamic ticket qualification Sector Nord AG developed the ((OTRS)) Community Edition Ticket Wizard. You can easily and quickly store guides as decision trees for important pending events in the Ticket Wizard. Knowledge and processes can be generated and matched in second-level support in this way, and then provided to first level support or the end customer. This makes it easy to harmonise the way incidents and malfunctions are handled. Incident response processes can be optimised. Acquired knowledge is retained and formalised. In particular, commonly occurring problems can be processed and closed in a targeted and standardised way in first level support or customer self service. Overheads and processing times are drastically reduced with a consistently high quality and new employees are quickly and meaningfully inducted. Thanks to the development and launch of the Ticket Wizard at the beginning of 2015 we were able to successfully achieve the targets we had set ourselves of "reducing the average call duration" and "increasing ticket quality". At the same time, we have remained flexible and can respond to changes in the decision trees at short notice.